Pedestrian Parking Lot Slip and Fall Accidents | Hupy and Abraham, S.C. In the United States, nearly 4,360 square miles of land is occupied by parking lots and garages that are utilized by millions of people each day. With such frequent use and exposure to the elements, it is no surprise that hundreds of people slip and fall in parking lots each year. Unfortunately, slip and fall accidents sometimes result in serious injuries. But if you're injured on someone's property due to their negligence, you could be entitled to compensation for your medical bills and lost time at work. Store and commercial business owners must be aware of potential injuries that could occur on their property and the threats they pose to customers. If you are injured due to a slip or a fall in a parking lot, you may be able to pursue what is called a premises liability case. However, you must be able to prove that the property owner was negligent to do so. To recover damages in a premises liability case, you must provide the burden of proof. (“The obligation to prove one's assertion.”) An injury alone does not automatically make a property owner liable. 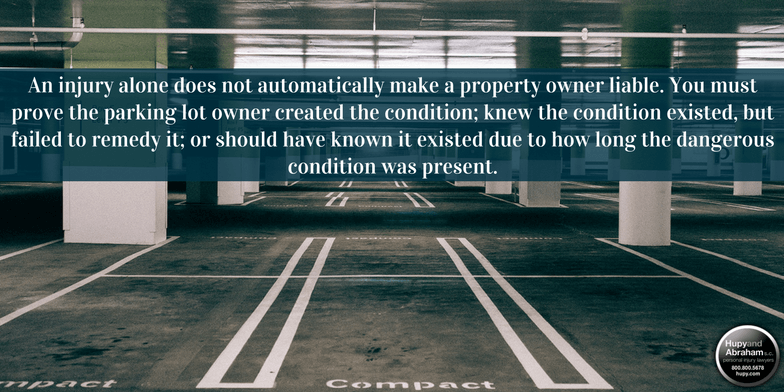 You must prove the parking lot owner created the condition; knew the condition existed, but failed to remedy it; or should have known it existed due to how long the dangerous condition was present. Snow or ice: Many towns, cities and states have different requirements regarding business owners’ responsibilities for snow removal. And it can be difficult to determine fault as snow and ice can appear and disappear in a matter of hours. However, if conditions on the property cause an unnatural accumulation of snow or ice, the owner may be liable for slip and fall injuries. Debris or damaged surfaces: A business owner is responsible for maintaining the parking lot so it is safe for a reasonable pedestrian. This includes filling and patching cracks, holes and broken wheel stops. Painted pavement: Many paints used in parking lots for lines and traffic markings contain warnings from the manufacturer that they are slippery when wet. These painted surfaces present slipping hazards that could be prevented (at minimal cost) by adding abrasives like sand to the paint for a safer, textured walking surface. Poor lighting: Inadequate lighting may also lead to accidents if a pedestrian trips over curbing, stairs, holes, or cracks at night or in poor weather. If you have been injured due to a slip or fall in a parking lot, the steps you take after the accident will be critical in building your premises liability case. In order to recover damages, you must show that a parking lot hazard caused your injury. Seek medical attention immediately after the fall. Collect the contact information from any witnesses to the accident. Contact an attorney right away if you suspect negligence. Most slip and fall cases are difficult to prove, and you’ll need the resources of a successful law firm to ensure you receive necessary compensation for your injury. If you or a loved one has been injured due to preventable slippery or damaged conditions in a parking lot, contact the experienced slip and fall accident attorneys at Hupy and Abraham today. Call 800-800-5678 for a free, no-obligation consultation, or start a live chat with us anytime at Hupy.com.